The pipes are commonly used as cable conduits and have excellent dielectric strength because of their insulation properties. The sizes range from 80mm to 200mm nominal diameter. They can be produced with either plain ends or socket ends, to faciliate ease of jointing and installation. They are available in grey and red colour. A special moulded 6" end cap is also available. 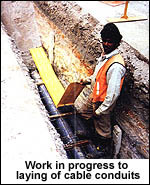 These pipes and fittings are approved by the Public Utilities Board and all other local authorities. They have the pressure strength of 12 Bar. This allow the pipes to be fitted to mechanical equipments, such as pumps and cooling towers. They are also used in conjunction with mechanical machinery in the factory. The sizes range from 80mm to 150mm nominal diameter. Produced in plains ends, these pipes are used in conveying cold water to household and irrigation purposes. These pipes are white in colour. 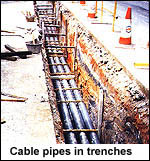 The pipes are suitable for use as in Class D, however are available in smaller sizes from 15mm to 50mm. They are used in the sprinkler system for watering purposes, such as to golf courses and parks. This range of pipes is highly suitable for transportation of drinking water as it does not import any odour, taste, colour or any toxic constituents in concentration that can be injurious to health. 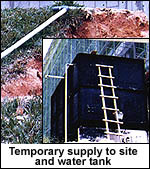 Thus, they are becoming commonly used even in temporary water sites. In addition, their durability makes them ideal for resistance to corrosion and ground condition.